In 2009 the Zetas were asked about a rumor that tungsten was being used in gold bars, as the weight and composition is so similar. The Zeta confirmed this rumor as based on fact, though no facts were available at that time to the public. This story is true and will lead to chaos among those marketing gold, especially among those dealers who state they will house the gold that the public buys. No doubt a new business to certify gold holdings will develop and flourish. The issue of gold stolen from Fort Knox or fake gold bars minted during the past couple decades will never be officially admitted by any government involved. Rather, those who are passed false gold will quietly be paid off, and compensated. This issue is also rift with blackmail possibilities. Now proof that tunsgsten is being used to substitute for gold in bars is at hand. 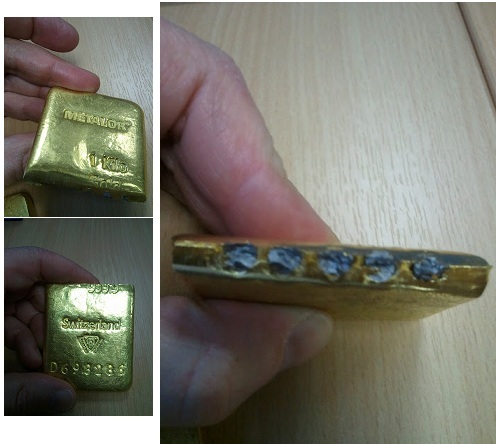 In the biggest news we've broke since the JP Morgan whistle-blower stepped forward, Australian Bullion Dealer ABC Bullion has contacted SD to advise that one of its suppliers has provided them photographic evidence of a tungsten filled 1 kilo gold bar discovered this week. The bar passed a hand-held xrf scan which showed 99.98% pure AU. The tungsten was only discovered when the bar was physically cut in half. After numerous reports of 400oz tungsten filled bars being discovered in Hong Kong, this is the first documented and verified report with photographic evidence that has been made public.